"I make this recipe in my smoker. 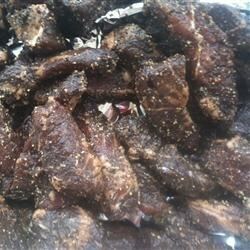 Make sure you store the jerky in an airtight container in the refrigerator." In a large, nonporous bowl, combine the ground black pepper, soy sauce, vinegar, hot pepper sauce and Worcestershire sauce. Mix well and add the meat slices. Cover and refrigerate overnight. Prepare an outdoor smoker for low heat and lightly oil grate. Lay meat strips out on grill so that they do not overlap. Smoke over low heat. Jerky will be done when the edges appear dry with just a slight hint of moisture in the center of the slices, about 6 to 8 hours. 6-8 hours at 200 degrees consistently makes great jerky. Adding a little home grown cerrano pepper works well too. Way too much pepper!!! This would probably be fine if you cut the amount of pepper by 75%!! to the guy below. use common sense idiot too much pepper to you is perfect for us. Entirely too much pepper. We ended up throwing 3/4 of the jerky in the trash--what a waste of time and money! I love pepered stuff but Im the only one here at our house, so I used Garlic salt insted. OMG that was great. thanks for putting this on line. Good Stuff! Came out great! Keep it on low though mine was over done after only five hours. We are eating it anyway it's still real good!